This article originally appeared in the Washington Post on April 26, 2017. When Linda Sarsour got involved in planning a massive Women’s March for the day after President Trump’s inauguration, she needed dozens of speakers to give brief remarks onstage. Sarsour, a Muslim activist, quickly found diverse and willing participants of faith, including a rabbi from California, a nun who travels the country. All were women she had last seen in November at a gathering of a new network of eminent religious leaders. This little-known group — which has 18 members, all of them prominent in religious organizations and highly active in national politics — is quietly seeking to bring together a “Religious Left” to counterbalance the decades-old Religious Right by supporting liberal politics with the imprimatur of faith. Among the members: Valarie Kaur, a Sikh activist whose prayer for America video gained national attention last month after the shooting of a Sikh man in Washington; the Rev. William Barber II, whose stirring address at the 2016 Democratic National Convention set social media aflame; and Gene Robinson, the Episcopal Church’s first gay bishop, who gave a prayer during a pre-inauguration event in 2009 for President-elect Barack Obama. “It’s sort of like getting the Martin Luther Kings, the Gandhis, the Rabbi Abraham Joshua Heschels, the Dorothy Days, the Fannie Lou Hamers of our time together and creating a sense of community,” said the Rev. Katharine Henderson, the president of Auburn Seminary in New York. Henderson helped launch this high-powered network. The seminary — a bit of a misnomer, since it does not train new clergy nowadays, but does offer continuing education for faith leaders further in their careers — first convened the members of the network, whom it terms “senior fellows,” in 2015. With funding from several philanthropic foundations, the senior fellows communicate online and by phone year-round and meet in person twice a year. It is during these meetings that the fellows — most of them heads of major congregations or activist organizations — put their heads together to discuss how the organizations they lead can work in concert. At the most recent meeting, held last month at a retreat center in Sedona, Ariz., much of the talk was about what each fellow’s congregants were doing to resist the Trump administration’s policies, and how their organizations could more effectively mobilize together. “The thing that’s really important about this group is the opportunity to speak candidly, to puzzle together: How do we do this justice work?” Sister Simone Campbell, who leads the Nuns on the Bus social justice group, said during the Sedona meeting. When the Nuns on the Bus drove to the Republican National Convention in August, Campbell recruited others from this network to join their demonstration. The fellows send each other links to petitions to sign. Sarsour’s fundraiser in which she asked her Muslim community to pay to repair a Jewish cemetery vandalized in Missouri was inspired in part by the interfaith discussions in this group. Jews then donated to repair mosques set on fire in Florida and Texas. “We’re really seeing in this moment that our communities are learning to support each other, and some of that was born in this space,” Henderson said. The hope for a “Religious Left” has risen in light of the protest activism since Trump’s inauguration, with a flurry of headlines predicting its revival and other writers scoffing at the idea. Clergy and other people of faith were at the forefront of liberal activism throughout the early 20th century, campaigning successfully for reforms in prisons, mental health and political corruption, among many issues. Most notably, African American preachers led the civil rights movement and were joined in their marches and voter registration efforts by liberal white ministers and rabbis. But scholars and pundits have been skeptical that religion could again be a significant motivating factor for liberal activists, like it still is for many conservatives. The would-be Religious Left is far less centralized than the right. The Religious Right, as organized by Jerry Falwell and others starting in the late 1970s, is dominated by white evangelical Protestants and joined by mostly white, conservative Catholics who share goals such as preventing abortions. The left would be a more diverse coalition — black Protestants, Hispanic Catholics, white mainline Protestants, Jews, Muslims, Hindus and humanists might all join in, depending on the issue. Organizing all those constituents around a moral mission, when their theologies and their demographics are so different, is a daunting idea. In addition, clergy tend to be less influential within the Democratic Party than they are in the Republican Party, since the Republican base skews much more religious. When nonbelievers are the biggest “faith” group in the Democratic Party, how could anyone expect Democrats to turn to clergy as readily as leaders of political activism? Shiffrin said that the association of Christianity with the Religious Right in the public mind — and particularly the fierce, religion-based opposition to expanding LGBT rights — has led liberals to express more hostility toward religion than at any time he’s ever witnessed, even in the days of the free-love, down-with-convention liberalism of the ’60s and ’70s. That doesn’t bode well for a network of clergy taking the helm of the anti-Trump liberal groundswell, he said. Many of the Auburn senior fellows already see themselves as leaders of the amorphous, nationwide movement that has spurred protests almost weekly since Trump’s inauguration. 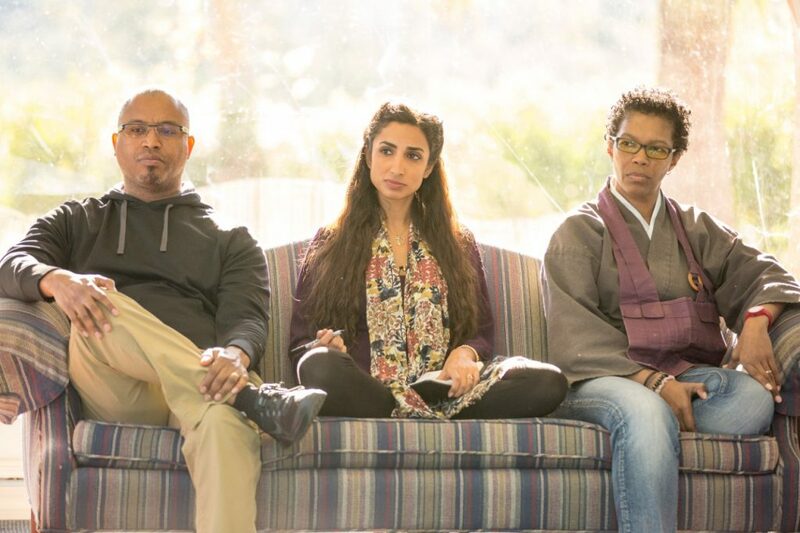 Discussing the idea of “the resistance” at their Sedona retreat, several said they felt that the new hashtag was something their faith-based organizations had been part of for years. “We had movements happening. Now what’s happening is things are just so hot-mess crazy that more and more people are pulled in,” said the Rev. Jacqui Lewis, a senior minister at Middle Collegiate Church in New York City. “We worked way too hard, some of us, for 25 years” to see progressive gains undone now, said Bishop Yvette Flunder. She talked about her California church’s work on protecting voting rights, undoing gerrymandering and defending women’s access to abortion, and she encouraged the other fellows to discuss how they could all collaborate on those goals. That’s the sort of behind-the-scenes networking that Auburn hopes will fuel progress, whatever you call it — the Religious Left, #TheResistance, or just good works. “It’s that kind of investing in relationships that means that when things start exploding in the world, then you know who to call,” Henderson said.